The kitchens of yesterday simply can’t be expected to keep up with the needs of today’s growing families or the newest trends. Kitchens and kitchen remodeling has come a long way. The average square footage of a kitchen remodel in 1985 was 160 square feet and now they are more than double that in size. Cabinetry was not as well thought out as it is now. In the 1980’s cabinetry consisted of light to medium Oak , and that was the standard. Today consumers have many more cabinetry options to choose from such as door styles, type of wood, self closing drawers and soft closing doors. 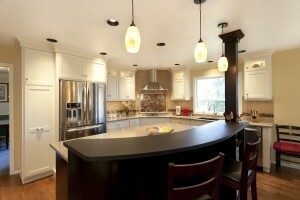 Cabinetry is not the only item to focus in on in the kitchen. There are so many things to consider when planning your next kitchen remodel. Whether it’s a full remodel or a simple face lift, by providing detailed planning in up front will make your remodeling project a pleasurable experience. With over 30 years of experience in the greater Vancouver WA area, Designers Northwest has the skills, resources & technical knowledge necessary to complete every remodeling project to exceed your expectations. For more information, give us a call at: (360) 885-1995!